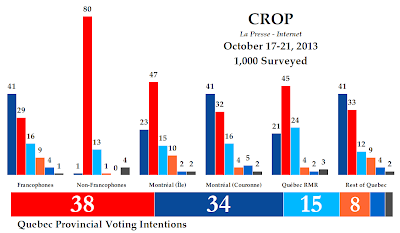 The latest La Presse/CROP poll was released yesterday, showing that the race is increasingly becoming two-headed in Quebec between Philippe Couillard's Liberals and Pauline Marois's Parti Québécois. Federally, the Liberals and New Democrats remain locked in a close race in the province. And in both cases, the likely seat count does not reflect the overall vote. The Liberals have picked up three points since CROP's mid-September check-up, and remain in the lead with 38% support. The Parti Québécois closed the gap by a tick with a four-point gain to reach 34%. Both parties are now above where they stood on election night in 2012. And the PQ has been gaining in every CROP since May, when they were registered at just 24%. The loser in the equation is the Coalition Avenir Québec, which dropped six points to only 15% support. 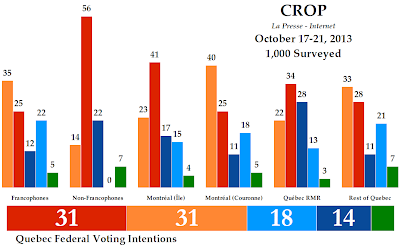 That is the lowest they have been in any poll by either CROP or Léger since the party's creation. Québec Solidaire was down three points to 8%, while 4% of respondents said they would vote for Option Nationale and 2% said they vote for another party. Of the total sample, 12% were undecided and another 6% said they would not vote or did not respond to the question. The PQ is heading into a caucus retreat to figure out if they should call an election after the municipal campaigns wrap-up on Nov. 3. A four-point deficit is not exactly a strong argument for taking such a risk, but the numbers are actually not that bad for the Parti Québécois: they have 41% support among francophones, a gain of six points in the last month. The Liberals trail at length with 29%, while the CAQ dropped eight points to 16% among this demographic. At around this level of support among francophones, the PQ does move into a position where they could theoretically win an election and even a majority government. But would Marois be able to keep the PQ at 40% or more among francophones throughout an entire election campaign? One imagines that is what the party will be trying to decide at their retreat. The Liberals have the non-francophone vote down more comfortably than they usually do, with 80% support. The CAQ came a distant second with 13%. The Liberals led in the two major cities, with 47% support on the island of Montreal and 45% support (a gain of 17 points) in Quebec City. They trailed with 33% in the regions of Quebec and 32% in the Montreal suburbs around the island. The Parti Québécois led in those suburbs with a 17-point gain to 41% support, while they also had 41% support (a gain of 11 points) in the regions. They were down 13 points on the island of Montreal to 23% (about where they were in the last election) and 10 points to 21% in Quebec City. The provincial capital was the best region for the CAQ, but 24% is not very impressive. The party was down 21 points to 16% in the suburbs of Montreal and eight points in the regions to just 12%. The CAQ did pick up nine points on the island of Montreal to reach 15%, but that will do them no good. You may have noticed that CROP's poll has wrenched upwards and downwards quite dramatically. Even with these small regional samples, shifts of 10-20 points are unusual. 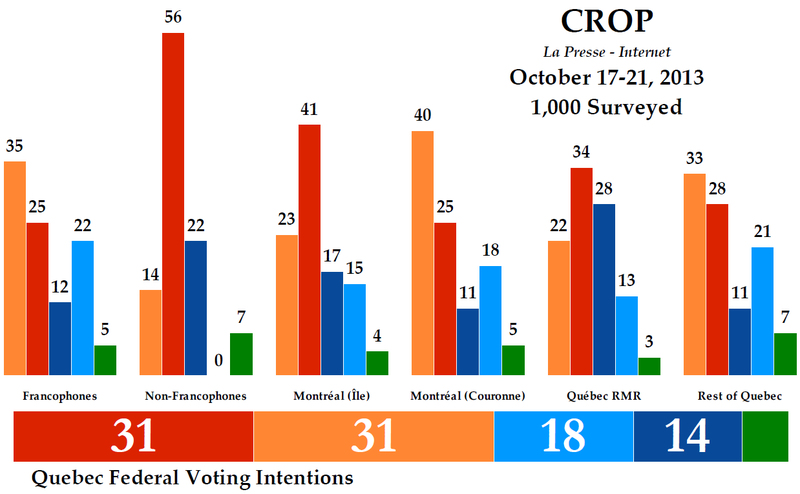 It would seem that the September poll was a bit of an anomaly, as these CROP numbers are aligning more closely with what we would expect and what we have seen in Léger's polls. Québec Solidaire was more stable, with only a drop of six points to 9% in the regions being of note. Elsewhere, the party had 4% in Quebec City and the Montreal suburbs and 10% on the island of Montreal. That is actually not a very strong performance, as QS had 12% on the island in the 2012 election. How much of a gamble would an election be for the PQ? With CROP's regional numbers, the model gives the party 63 seats and awards 59 to the Liberals. That is about as risky as it gets, since the PQ is straddling the line of a majority government and is also just four seats up on the PLQ. It would not take much to flip those numbers. Québec Solidaire would retain their two seats and the CAQ would win one. Their regional numbers are just too low (16% in the suburbs represents half of the vote they took in that region in 2012), but I imagine a few incumbents could prove hard to knock off. That has just as much chance of hurting the PQ as it does the Liberals, making a majority government somewhat less likely. Do any of the fundamentals help or hinder the PQ's electoral chances? That, too, is a mixed bag. Satisfaction with the government was unchanged at just 35%, suggesting the PQ may have little room for growth. That is among its better results since coming to power, though, so the PQ may look at the current climate as being as good as it will get. Support for sovereignty was at 38% in the poll, also limiting the party's potential for real growth (with ON and QS, sovereigntist parties already have 46% support). 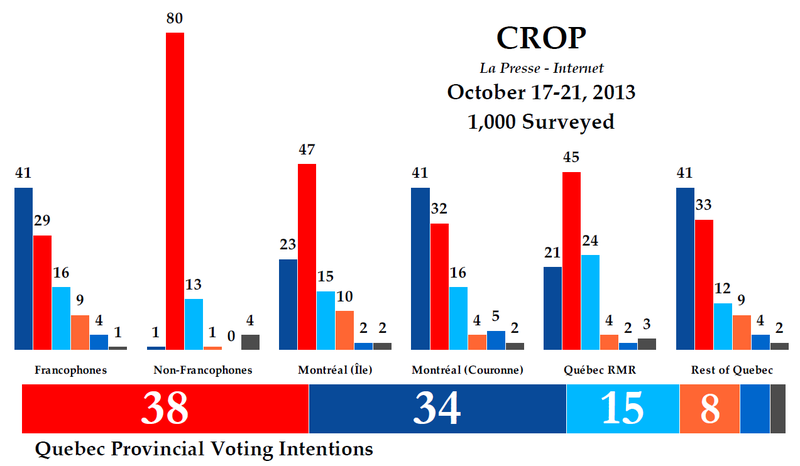 The leadership numbers may be tilting in Marois's favour, however. Largely by default: Marois was up three points to 23%, putting her narrowly ahead of Couillard who fell five points to 22%. Poor François Legault was down two points to 13%. Françoise David had 7%. The numbers seem to have stabilized over the last month, so the PQ may not get the kind of results they are hoping for that would make an election call an easy decision to make in the next few weeks. But would the PQ do better in an election now, with debate focused primarily on the Charter of Quebec Values (whose popularity has been increasing in polls from both CROP and Léger), or in the spring, when they are likely to present a budget that puts the province back in the red? The answer is rather obvious. On the other hand, if the PQ waits will the CAQ impale itself and bring down the government in the spring if they are still polling in the teens? The contest at the federal level is even closer. The NDP slipped two points since September to 31%, putting them in a tie with the Liberals, who held steady. The Bloc Québécois was up a point to 18%, the Conservatives were unchanged at 14%, and the Greens were up one point to 6%. Of the entire sample, 9% were undecided and another 5% did not respond. A close race looking a lot like this has become the polling consensus of late. But CROP let's us take a peak at the regional and demographic numbers, showing that the race is not as close throughout the province. The New Democrats have retained the advantage among francophones, with 35% support to 25% for the Liberals and 22% for the Bloc Québécois. The Liberals are still well ahead among non-francophones, however, with 56% to 22% for the Conservatives and just 14% for the NDP. Like their provincial cousins, the Liberals were ahead on the island of Montreal with 41% support (a gain of 11 points) and in Quebec City with 34%. They were in second in the Montreal suburbs with 25% and in the regions of Quebec with 28%. The NDP's vote broke down similarly to the PQ's, with 40% support in the suburbs of Montreal (a drop of 10 points) and 33% in the regions. They had just 23% support on the island and 22% in Quebec City, putting them in third place. The Conservatives were second in the provincial capital with 28%, but were well behind with 17% on the island of Montreal and 11% in the rest of Quebec. The Bloc Québécois had 21% support in the regions, 18% in the Montreal suburbs, 15% on the island, and 13% in Quebec City. If they are to have a hope of pulling more than a handful of seats out of these low numbers, they need to do better in at least one part of the province. The NDP's lead among francophones gives them the majority of Quebec's seats with 41, compared to 29 for the Liberals, six for the Conservatives, and just two for the Bloc Québécois. The Liberals do dominate the island of Montreal and win the most seats in Quebec City, but it is the NDP's advantage in the Montreal suburbs and the francophone regions of Quebec that wins the day. This is a bit of a change from earlier poll numbers in Quebec, when the Liberals were doing well in all regions of the province. The party seems to be reverting back to their traditional bases of support when they were a major player in the province before the sponsorship scandal hollowed them out. Compared to where the party has been in Quebec in the last three elections that is certainly good news, but it will make a decisive electoral victory difficult for the party. For the NDP, a base of support in francophone Quebec alone assures the party more seats in the House of Commons than they ever achieved before 2011. On leadership, both Justin Trudeau and Thomas Mulcair slipped by two points to 26% and 25%, respectively. Stephen Harper was well behind with 11%, while Daniel Paillé and Elizabeth May tied at 5%. It would seem that both the Liberals and New Democrats would be quite pleased with vote intentions settling in at around these levels of support for the next two years. It puts both in a position to turn a good campaign into electoral gains. The NDP gets to prove they have lasting power in Quebec, while the Liberals get to show they have recovered from the doldrums of the 2006, 2008, and 2011 elections in the province. But Quebecers have not been sitting still for very long lately. Incredible. The possibility of winning a majority government on only 34% of the vote and 4 points behind another party. Our system is *messed up*. Agreed. It wouldn't be the first time this has happened in Canadian politics either. A part of me wants this result to actually come to pass to give the country a reminder of just how unfair majoritarian electoral systems like first past the post can be. PR or its variants are equally capable of producing "skewed results": The Labour party in South Australia won the 2010 election with a majority even though the Liberals captured 52% of the Two Part Preferred vote! The legitimacy or lack thereof of a voting system depends on one's perception of reality. I would question PR which allows minor parties sometimes with only 2 or 3% of the popular vote to effectively choose government. We see this in Israel, Germany, Italy or Ireland. Some may argue that the minor party plus the main party constitute a majority of the popular vote however, it is the minor party who holds the decision making power not the major one since they either give or with hold support. This support is given or with held in a closed door process which is hardly democratic. Finally I would question the suitability and logic of a PR voting system within a parliamentary system (Westminster or otherwise) that is ruled by the majority. If legislation is passed by 50%+1 votes in Parliament it makes little sense to create a system that denies governments a majority. To do so is to create gridlock and paralysis in government and to allow government and Parliament to be ineffective. Recently we have witnessed such results in Belgium where 18 months after a general election no government was in place and state decisions were made by the caretaker cabinet and King. Bede - South Australia uses instant run-off voting. That's not a proportional system. Also FYI Germany has a threshold of 5% so parties with 2% to 3% don't even get a seat. And I'd like you to name even one time when a ~5% party chose who formed government in Germany. Or in Ireland for that matter. Belgium had a deadlock because by convention the government must have a majority in both the French speaking and Flemish speaking communities. It's this double-majority requirement that makes government formation so difficult there, and that has little to do with its electoral system. Italy doesn't even use proportional representation. They use something called "reinforced PR" where whichever party gets the most votes gets bonus seats such that they have 55% of the legislature. If you're concern with PR is minority governments, then Italy is a really poor example. Greece uses this system as well. They had 16 straight years of strong, stable single party majority governments for each of the 16 years leading to the current crisis. How are those years of majority governments working out for the Greek people now? Proportional representation does not produce minority governments - it produces coalition governments. Those coalition governments have proven on average to be more stable and enduring than our own governments in Canada. Which makes sense, as those are governments that actually have the support of most of their people. But let's suppose for a second that minority governments are in fact the norm under proportional representation. Would that be such a bad thing? In Canada over the last 50 years, minority governments have averaged lower deficits than majority governments (though the sample size for both is small). Old age pensions, universal health care, the Canada Pensions Plan and even our flag all came about under minority governments. Not a bad legacy in my opinion. I'd also think that most people on both the left and right would concede that Stephen Harper governed better when he had a minority than with a majority. There are six democracies in the world with a GDP per capita higher than Canada's. All 6 also have lower income inequality. 5 of them use an open-list form of proportional representation for their House. The 6th uses it for their Senate. Who knows, if we implemented PR here we might end up like one of those countries. Heaven for bid we become a hell hole like Sweden. As to your arguments regarding the wonderful things Canadian minority governments have achieved it is a data-mined collection. The first thing I would point out is Medicare was introduced under the Liberal majority government of St-Laurent in 1957 (Hospital Insurance Diagnostic Act) and ratified by all provinces under the Tory majority of Diefenbaker. By the time the Medicare Act came into effect in 1966 universal medical care in some form had existed nationally for almost 10 years and provincially for 20 in Saskatchewan so the measure was not particularly controversial. This is the true progeny of minority governments: uncontroversial legislation, the easy decisions. In any case such arguments and your subsequent one on income equality (and the necessity of socialism?) distract from the main topic I broached; the unfairness of minority parties and hence a minority of the electorate effectively choosing government which is the real problem with proportional systems; they give too much power and influence to a small minority of people and parliamentarians. The 1998 German federal election is a case in point; the former communists captured 5.1% of the vote and 43 seats guaranteeing a SPD government. Of course the former communists would have equally been within their right to side with Herr Kohl and the CDU/CSU. In 2010 Julia Gillard won a minority government in Australia she was kept in power by a Green MP and a couple of independents none of whom had campaigned in support of a Gillard ministry nor had Gillard campaigned in support of a ministry supported by them. In this way 3 individuals choose who would be PM and hence government in Australia. Sweden is a lovely country and has equivalent social programs to most others in the Western World but, it is also a country with significant state investment in industry. On the face of it Swedes have an annual income of $57K but, when cost of living is factored in their income falls a third to just over $40K significantly less than the $43+k Canadians enjoy. As the Belgium example demonstrates it is far easier for a homogeneous country like Sweden to have PR than a fragmented culturally and federated country like Belgium or Canada: PR makes it easier to create divisions politically and parliamentary paralysis. While you have only demonstrated the good that minority parliaments have done it is equally important to remember that during minority parliaments produced the three most serious constitutional crises in Canadian history: The Pacific scandal and crisis that brought down the government of Sir John A. Macdonald; the King-Byng crisis and; the 2008 coalition-prorogation crisis. I would also point out the minority parliaments of the 1920's, 1950's and 2000's were not particularly effective in stemming the economic or social effects of deep recessions. Of course one thing that goes without saying is that in almost every election in Quebec, polls tend to underestimate support for the Quebec Liberals. Last year there was literally not a single poll that ever showed the Libs getting anywhere near the 30% they wound up with. The QC Liberal vote tends to be among older people who are much more likely to turn out etc... and there seems to be some sort of a quiet hidden Liberal/federalist vote that emerges at the ballot box in Quebec - almost without exception. If the final polls in Quebec have the Liberals four points ahead of the PQ - I put my money on that expanding to a six point lead when the votes are counted and that means a liberal majority. Hmm, in 2007 and 2008 both Leger and CROP over-estimated PLQ support, so I don't think your rule is all that universal. Also, Forum did have the PLQ at 29% in their final poll (they also had the PQ at 36%...). Even if they did tend underestimate Liberal support, I think it would still be inadvisable to assume that because something was true in the past it will automatically be true in the future. When Quebecers are together, they are nationalists. When a Quebecer is alone at the poling station, he is a Liberal. And the latest Forum poll has the Libs at 40 and the CPC at 28 !! Looks like the Senate scandal really is damaging ? ?